Tentworld: How to get the most from your icebox! Get the maximum performance! How to get the most from your icebox! Get the maximum performance! On my recent trip to Fraser Island, it came to my attention that there are many differing opinions in how to best use your icebox, esky or chilly bin. This created a lengthy heated discussion, with everyone there adamant that their method was the best, no dispute. In the end we agreed to disagree and moved on and continued relaxing. 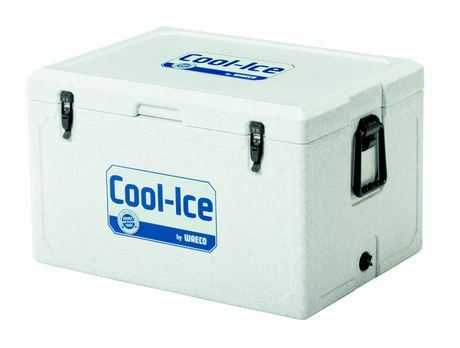 This is a Waeco Cool-Ice Icebox very popular in the outdoor market. This got me thinking though. If I don't know what the best way to load a icebox. How many of our customers that come in buying iceboxes know how to get the most out of their icebox? Depending on the size of your icebox (the larger the longer) manufacturers state the ice is good for up to 10 days! I started making plans to run an experiment, planning how many ice boxes I would need and setting the control environment. I then realised, that all I really needed to do was ask the team at Dometic Waeco, they're very scientific in their approach and have been making quality iceboxes for Australia, Europe and America. Use quality ice - party ice is not good, it has a high surface area often isn't deep frozen and isn't dense - thus it melts quick. Use block ice - you can make your own by freezing some milk containers or similar. The recommended ratio of ice to product is 1/3 ice to 2/3 product in volume. Pre-Cool - The day before loading your icebox to head away, load ice into it to cool down the box itself. Reduce air space - Always be working towards reducing the amount of air space, air transfers heat quickly and really reduces the ice life. Reduce opening time - Organise the icebox in such a way that the lid doesn't have to be open any longer than necessary. Refasten the icebox lid after opening every time. Open your icebox less. Try to minimise how often you open it. Dont Drain! - Do not drain melted ice from your icebox at all, this reduces the remaining ice life significantly. Buy two smaller iceboxes. If you're considering buying a 100 litre icebox or larger, think again. Buying two iceboxes allows you to use one for drinks, and another for food! You can decide which is most important to keep cold! :) Plus they're easier to carry and more useful on the weekends for parties. Some campers do also use dry ice, however in many cases this can damage your ice box and void your warranty. So if you do use this please be careful. Thanks for reading, I hope that you have found this information valuable.